My Legs are HUGE - Can you Fit me, for a pair of Compression Stockings? I hear these desperate words from so many of our customers - What have you got to FIT ME - I'm obeise and my legs are Huge?? I respond, "We will try our best to fit you, providing you the proper size to make your legs feel better." I’m Jamie, I answer the phone as a customer sales representative, I'm a “Certified Fitting Specialists” for medical compression legwear at RescueLegs.com. I'm on the phone daily with individual's asking me to help them find the right compression stocking their doctor has ask them to wear. However it can be difficult finding the proper fit for obeise individuals with Extra, Extra Large ankles and calfs and upper thighs. The doctor’s main concern is to making the swelling will away, which if not treated can lead to serious vascular problems, that's where compression stockings are effective. Most the time these individuals have Edema, lots of swelling of the legs from a buildup of extra fluid, also associated with other vascular and medical problems. What are you looking for a (Thigh High or Knee High), and what Compression Level does your doctor recommend? Do you have your leg measurements? 99% of these customers are coming straight from their doctor, and yes they have their leg measurements or have went to the closest pharmacy to get measured. Many of these leg measurements are huge, meaning extra, extra large size compression stockings / garments are needed to accomadate the measurements, for a proper fitting. to do the job of relieving pressure, swelling / edema and somtimes burning and aching legs and feet. 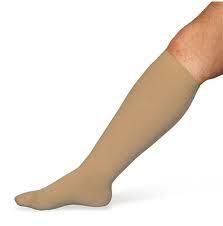 A lot of the times the doctor prescribes the (THIGH-HIGH) Compression Stockings. Honestly, when a person is big and has a lot of swelling, it’s hard enough to fit the (ankle and calf), but 100 times harder to fit the upper thigh. So I have to tell them, YES and NO, meaning Yes I can provide a PLUS SIZE (Knee-High) Compression Stocking, but No, your upper thigh measurements are too big to fit into a Thigh-High Stocking. Many years ago, Dr. Barrington in upstate New York, said something I will never forget. I'm "quoting" his exact words, “It’s better to have something on, than nothing.” He explained that yes his patient needed the thigh-high stocking, because of also having the upper leg swelling. However, these are Gradient Compression Stockings, the main squeeze is the ankle, which provides 100% compression and the calf area provides 70% compression and the upper thigh only 40% compression. Some of your biggest blood vessels are located in the lower extremity, the ankle. This squeeze will help get the blood circulation, returning the blood to the heart. His solution was to (lightly wrap the upper thigh) and let the Compression Stockings do their job on the ankle and calf. I’m happy to say, I have had so many of our customers to call back and say, You were Right, the doctor agreed, wear the Knee High stockings and let’s see if the (swelling) goes down. They call back saying, the Compression Stockings WORKED!! What a Relief!! Take the time to check out our selection of Big Size and Plus Size Compression Stockings in Wide Calf Knee High's, specially designed for a "proper comfortable fit" for the larger individual. When a customer comes back and does a repeat order, we know we have provided quality stockings and the proper big and plus size to accomodate them and help get good blood flow in the lower extremities of the legs, to reduce the swelling and the achey feeling that occurs when the legs have chronic venous insufficiency. See below a few of our most popular brand name quality knee high's, thigh high's and our Queen Size compression tights and pantyhose that our customers come back to order again. The most important question I will ask, will be your ankle and calf measurement, to make sure we provide you with the proper size needed to ensure your legs get the compression needed, for good blood circulation. Please talk to your physician about any symptoms or problems you are experiencing with your legs and feet. Why do I like my job, it give me a "good feeling" knowing we can Help!! So please call and ask for Jamie, I will gladly assist you with a proper fit, and I will be happy to answer any questions you may have. 1-844-629-9642.